Our biggest sale of the year is now on! Learn how you can save up to $50,000 on your dream home. We have $2.4 Million in inventory, and it all must go during this sale. Our biggest sale of the year is now on! Learn how you can save up to $20,000 on your dream home. 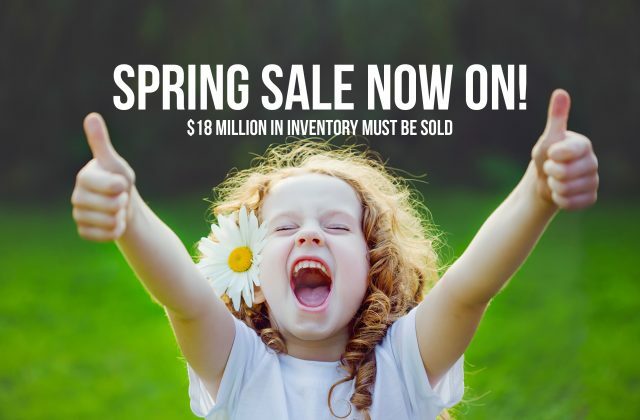 We have $18 Million in inventory, and it all must go during this sale. Need a quick possession commercial office for your growing business? This 1728 square foot commercial office is for sale and has been reduced to under $160 per square foot. BC Peace Country, we’ve got you covered! Downsize Without Compromise. Check it out! We have various fully staged show homes for you to look through along with spec homes that are move-in ready. Did we mention that full landscaping and a 10′ x 12′ deck are included in all our homes? That means you’ll have all summer to enjoy doing the things you want, not having to lay sod, plant trees and pick out shrubs!